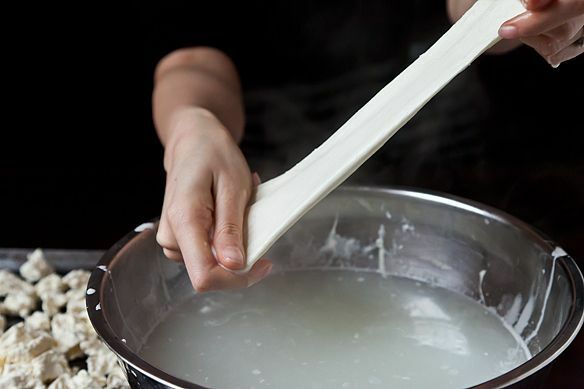 We've asked you to get together and host mozzarella-making parties the weekend of April 20th (find a party near you here) -- and now, our Associate Editor Kristy Mucci shows you how it's done! Read on below for her step-by-step tutorial (and recipe!) for making delicious mozzarella at home. I am by no means a cheesemonger. 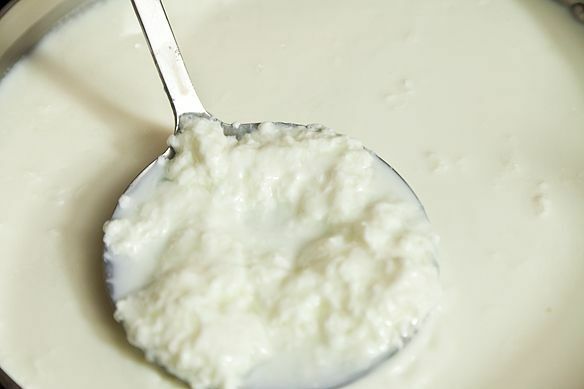 Before we talked about writing this post, I'd only ever made ricotta. So, being thorough, I decided to make mozzarella enough times to feel comfortable sharing a method. I've been practicing in the FOOD52 kitchen, and in my own kitchen, for months (I like to be really thorough). For a while I thought I could make it happen without rennet, but I tested my theory and know better now. You need rennet. You also need citric acid powder. Luckily, those things are easy to locate. If you can find non-homogenized milk, I suggest you use that -- and please, stick to whole milk. The rest is really easy and fun, and if I can do it, anyone can. 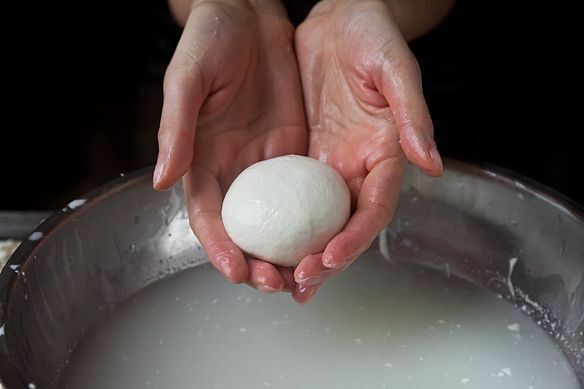 I'm showing you how I've successfully made mozzarella but if you have any tips, or favorite sources for supplies, I hope you'll share them in the comments section. First you have to make the curd. Start by dissolving rennet (on the left) and citric acid (on the right) in water. I prefer the rennet tablets over the liquid rennet. You can order these ingredients from Dairy Connection or The Cheesemaker. We also found this kit which has enough supplies to make four batches of cheese. You can sometimes buy mozzarella curd from a local cheese shop, but making it from scratch is so satisfying. And it really doesn't take very long, so why not? 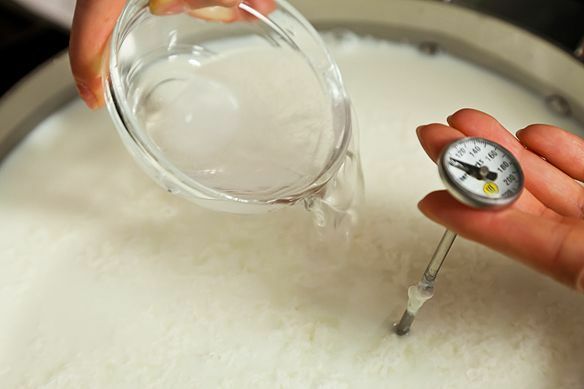 Pour your milk into a pot and heat it to 85 degrees F over a medium-low flame, then add the citric acid solution. Using a slotted spoon, give the milk a gentle stir. Keep an eye on the temperature. 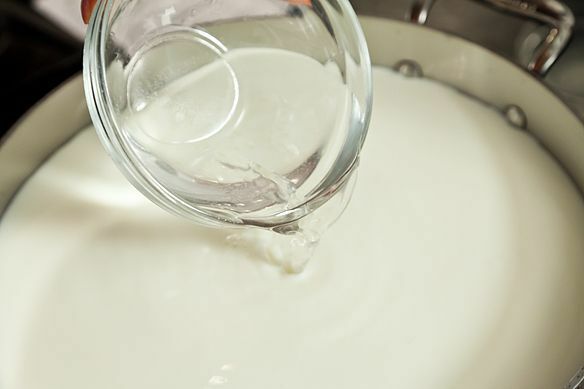 Let the milk heat up to 100 degrees F and add the rennet mixture. Very gently stir the milk -- you'll start to see curds, just lift them up and down a few times and make sure nothing is sticking to the bottom of the pot. Don't over-stir or move your spoon vigorously. 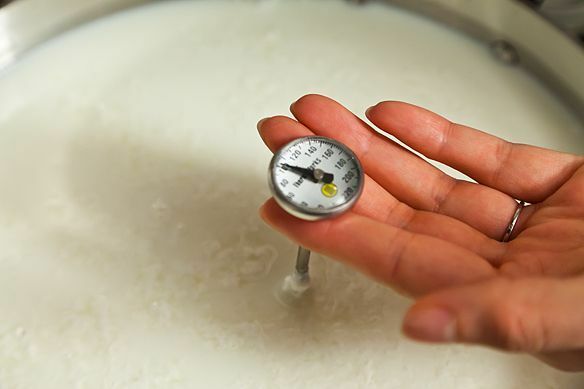 When the milk reaches 105 degrees F, turn off the heat and cover the pot. Let it sit for 10 minutes. The curds will have come together into a solid-looking mass, the whey will have a yellow tint -- just like the photo on the right. Place a colander on top of a bowl. 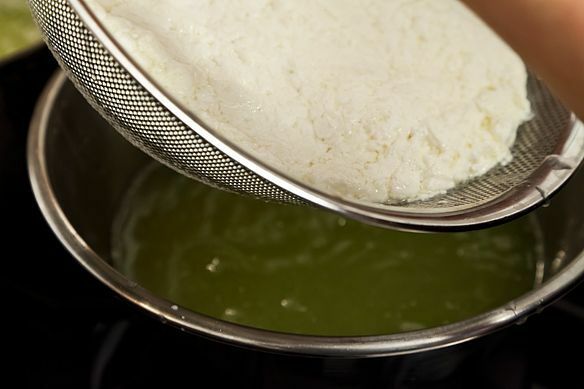 Use a slotted spoon to lift the curds and place them into the colander. Let the whey drain off. Lift the colander to keep draining the whey. 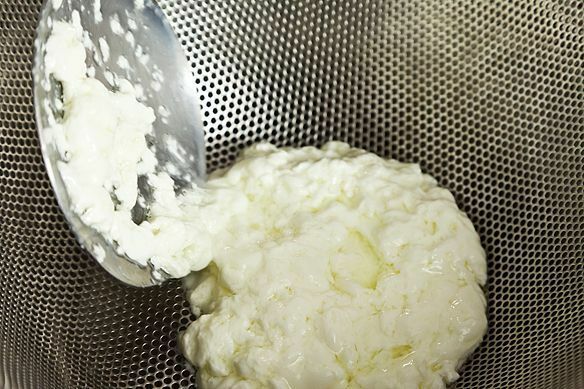 Using your hands, very gently (that's the key word when dealing with curds) press the whey out of the curds. 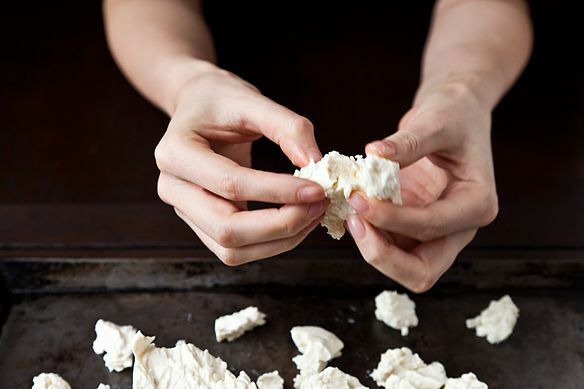 When your curds are drained, break them up into evenly sized pieces. You need hot water for the next step -- as hot as your hands can handle. I've found that 180 degrees F is a good temperature for this step (but that's me, go your own way if that's too hot). I like to bring it to a boil and let it cool -- use your thermometer here and be careful when you're testing the water with your hands. Wearing food-safe gloves can help protect your hands from the heat if you're sensitive. And don't forget to salt your water here, this is when your cheese gets flavor. You can buy cheese salt, but any non-iodized coarse salt will do. 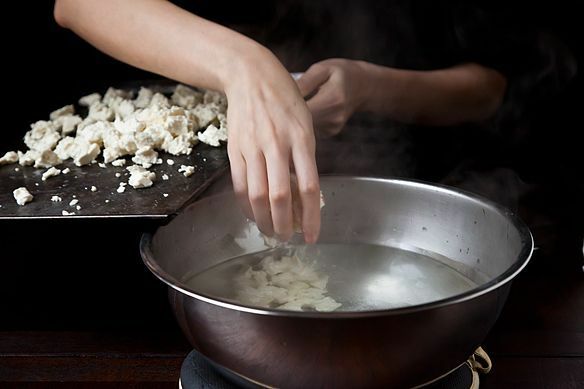 Gently drop curds into the water. 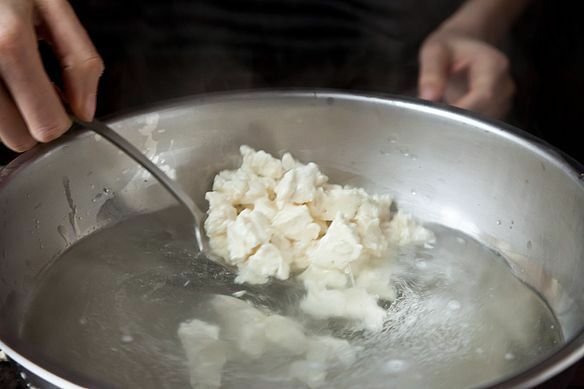 Using a large spoon, lift the curds to see if they're ready for kneading. They're ready when they are melty-looking, like in the photo on the right. Now's the fun part: stretch and knead! And stretch and knead. 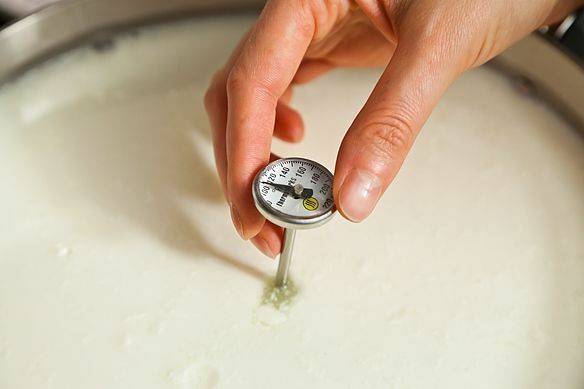 If the cheese starts to get cold and stiff, dunk it back into the hot water. 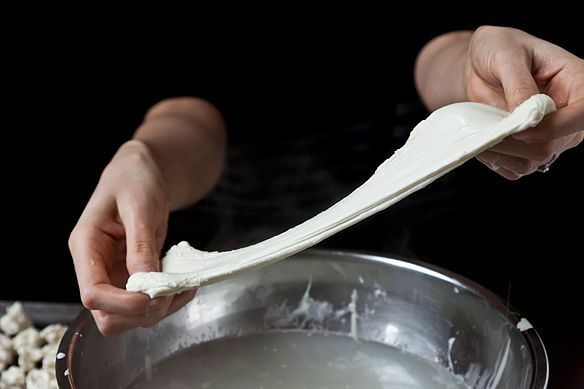 Keep doing this until the cheese starts to feel smooth -- you don't want your mozzarella to have a rough, flaky exterior. This can take anywhere from 5-20 minutes. Then form the cheese into a ball, or any other shape you might want. Garnish as you like, and enjoy. 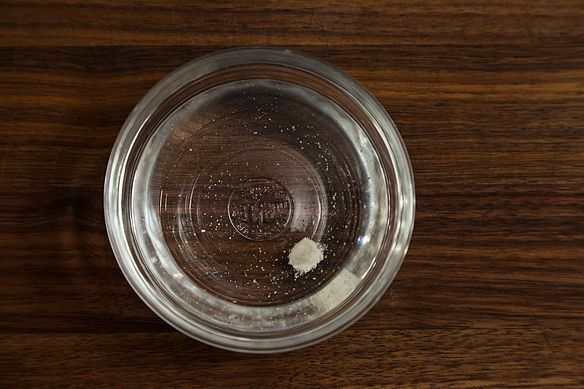 How much salt do you actually put in the water? We made this rather successfully, but the cheese is a bit plastic-y, not soft like mozzarella should be. I used raw sheep milk and it very quickly formed a 'block' of curd. The final product is definitely cheese, and probably will taste great molten but not so much to eat like this. Could it be we pressed too much whey out? update, the cheese went 'see through' rather quickly and didn't taste like mozarella at all... the milk had a really high fat content so that couldn't have been it, any ideas? 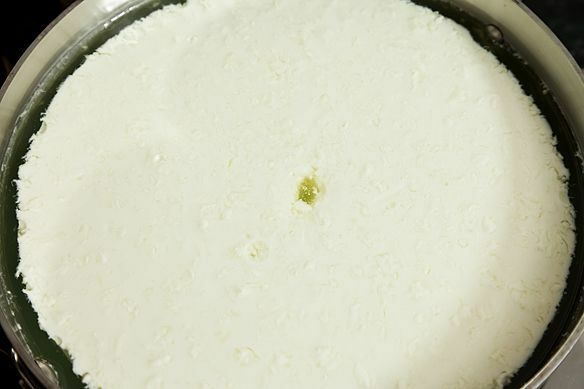 My curds are the texture of set yogurt - too soft to attempt to strain. Any way I can save this batch? I have made Mozzarella only once. While my mother thought it was great, my father thought it was a little milky tasting. Is there a specific known cause for this and a way to prevent it? Kristen, this tutorial is really helpful and simple to understand. Thanks! I agree! This was actually all Kristy Mucci's work (our Associate Editor) from the research and testing to photo styling to writing -- we're all in awe of how beautifully it all came out. oops! I meant Kristy..I very good at shuffling names. Sorry! Kristy. Thanks! I plan on trying again before the potluck party takes place. I will let you know! 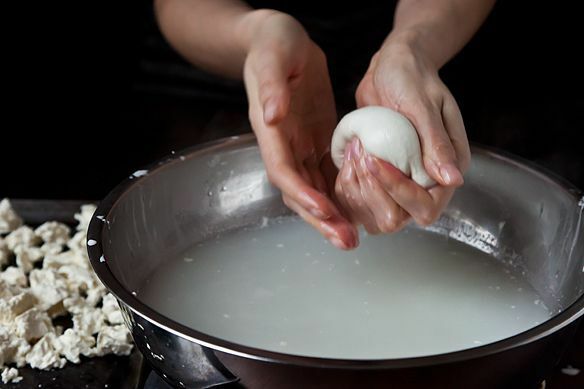 I found a site from where I ordered my Mozzarella Making kit really useful, it is the from the cheesemaking.com and in a video on youtube by cgicitizen , similar method of making mozzarella which is similar to some extent to Kristen but not exactly same. But, your mozzarella on left looks good. Hey there, great tutorial! I just wanted to add that Lipase powder adds a lot of flavor to mozzarella cheese. My husband and I made a batch (different version) a few weeks ago and got to add the lipase to it. OMGosh it was delicious! We noticed that it was even better after it set for about 5 days, the flavor was amazing!! Definitely not something you can buy at the grocery store. Thank you for this very clear tutorial. We made cheese for my son's 2nd grade science fair (Understanding Chemical Reactions). We looked everywhere on line and could not find anything as clear and easy to follow as your instructions here. Thank you! What a nice note! Thanks so much! Can I use Junket instead of rennet tablets? I haven't tried that. Since Junket is specified as being for custard and ice cream, I'd play it safe and order the rennet tablets. The kit only comes with 1 tablet, so maybe that is a good place to start. 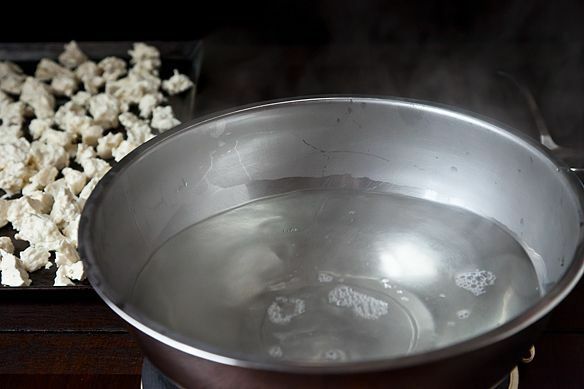 There is a recipe for mozzarella using Junket rennet in the book Artisan Cheese Making at Home. Instead of forming into balls, you can tie the kneaded string into little knots. To marinate, toss with olive oil, very finely chopped parsley, very finely minced basil, and crushed red pepper. Delicious! 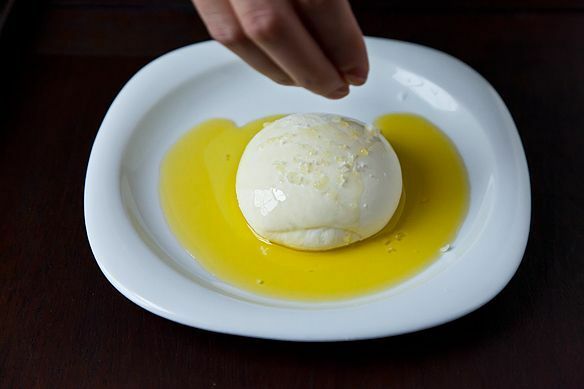 Any ideas on how to make burrata with the fresh curds? Are you trying to avoid chlorine when you specify 'filtered' water? Yes. 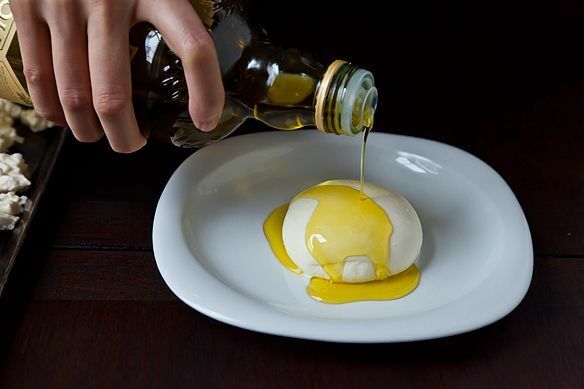 You don't want the water to add any funny flavors to your mozzarella. Also, chlorine can reduce the effectiveness of your rennet. I just had a Twitter conversation about this, today! As soon as I can lay my hands on the vegetarian rennet (I already have citric acid) and hit the Whole Foods for the non-homogenized milk, I'm in! Does anyone know where to get rennet and citric acid in New York? Hey Anna, Sur La Table sells those kits I linked to. Hope that helps! 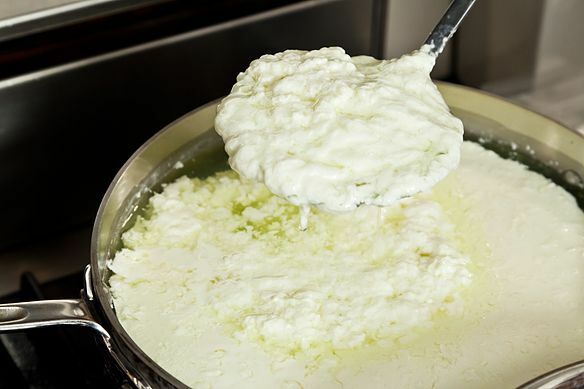 I have seen Rikki the Cheesemaking Queen's mozzarella and ricotta making kit at Murray's as well as a few other places (Brooklyn Victory Garden). I have it and it comes with the thermometer, cheesecloth and a little recipe booklet as well (with things to do with the leftover whey for instance). What do you do with the leftover whey? I just made ricotta cheese this week and was asking myself the same question as I had one qt of whey in my frig. I ended up finding a whole list of food items you can sub it for. Today I am using it in place of the water in a bread recipe. Absolutely! 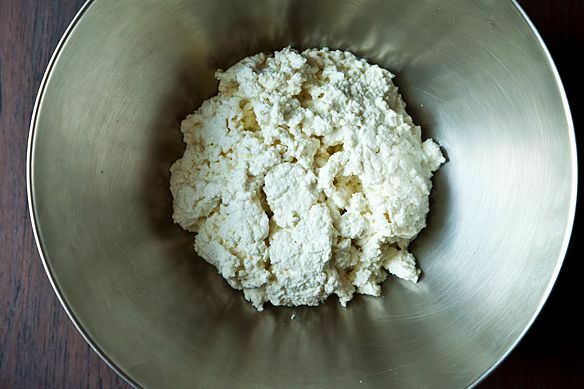 When I make Indian paneer cheese, I always use the whey to bake bread instead of water or milk. It's a great protein addition. Feed left over whey to the pigs. No, seriously, this is what my local cheese maker does. Eventually, the pigs are turned into saucisse (salami). Use instead of water to cover your meat/veggies when making a homemade stock. Many more things to do too! I post lots of ideas on farmcurious.com. Happy cheese making! 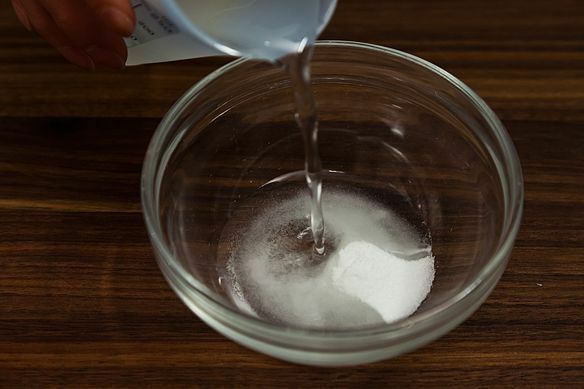 How much citric acid to use? Did you use standard vitamin c tablets? I used the citric acid powder you can get from any of the three sources I linked to. I never read about using vitamin C tablets, have you? Where can I find Microbial Rennet (the vegetarian version)?, Would be great if you could direct me to a link please! Panfusine, Dairy Connection has vegetarian rennet -- I made sure to find sources with both options! Found the link from the cheese sites,! thanks!